Northwestern was given its highest ranking ever on Friday, and the team did not disappoint. The Wildcats, ranked No. 2 in the country in the year’s first official poll, went on to sweep at the Philadelphia Invitational on Sunday. The four wins included an overtime victory against No. 3 Columbia and pushed NU’s record to 27-1. CollegeFencing360.com’s Women’s Coaches Poll rankings released Friday morning put Notre Dame at the top. NU’s 14-13 win over Columbia gave the Cats a 3-1 record against the top five this season, with the only loss coming against Notre Dame in November. Coach Zach Moss, who is in his third year at the helm for NU, called the ranking a milestone for the program and an acknowledgement of the team’s hard work. After receiving the ranking, the Cats would be immediately tested, as they stood to face No. 10 Temple and the Lions on Sunday. NU took down Temple 15-12 to start the day, led by a 7-2 foil win. Next, the Cats defeated Yale 18-9 and New York University 20-7. “This weekend we did a much better job of starting strong and just fencing through the end and not starting slow or letting up in the middle,” Moss said. The consistency came despite scheduling confusion throughout the day. Some colleges dropped from the meet because of winter storms in the area, including NU’s final opponent of the day, Drew. Senior foil Yvonne Chart put up 2-1 records against Temple and Columbia and swept her three bouts with Yale. After Temple, she said, the team didn’t know what the schedule would be with so many teams unable to make it. As the end of the day approached, however, the Cats knew their last matchup would be with Columbia, who beat Notre Dame earlier in the day. NU’s sabres have the shortest fights of the three weapon disciplines and gave the Cats a head start, winning seven of their nine bouts. 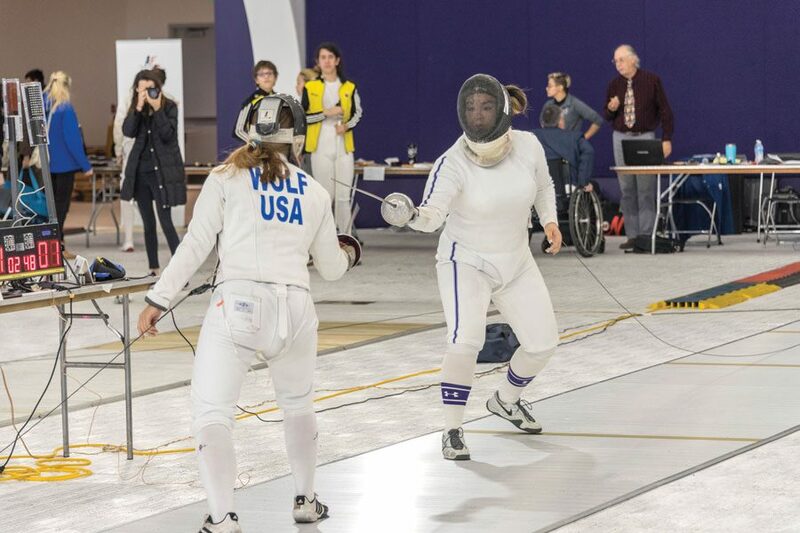 Junior epée Pauline Hamilton fenced the final bout against Columbia, with the teams tied 13-13. Hamilton held a 4-3 lead with 10 seconds left, but Columbia’s Anne Cebula leveled the score, forcing overtime. In the sport’s sudden death overtime, one fencer is given priority — if nobody scores during the minute-long period, that fencer wins. Hamilton lost the coin toss and Cebula, who fenced for the U.S. junior national team last year, took priority. Fifty nervous seconds later, Hamilton landed the winning touch, making it 14-13 NU. Chart called Hamilton “a star under pressure,” and said that the win over perennial power Columbia shows that NU is moving up in the fencing world.